Åslund, A. 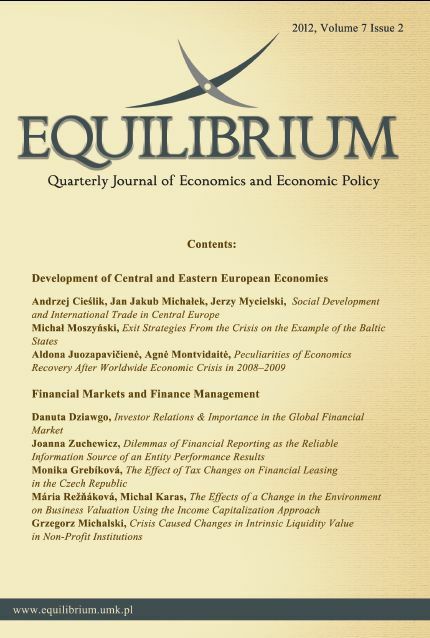 (2010), The Last Shall Be The First, The East European Financial Crisis, 2008-2010, Peterson Institute For International Economics, Washington. Bank of International Settlements (2011), Consolidated banking statistics, Table 9B: Consolidated foreign claims of reporting banks, www.bis.org. Becker T. (2009), IMF and Latvia – why going for third best?, Stockholm Institute of Transition Economics (SITE) at the Stockholm School of Economics, www.hhs.se/site. The Council Of The European Union (2009), Council opinion of 10 March 2009 on the updated convergence programme of Lithuania, 2008-2011 (2009/C 70/02). Eurobarometr (2010), Flash EB No 296 – Introduction of the euro in the new Member States. European Central Bank (2011) Statistical Pocket Book February 2011. European Commission (2010a), General Government Data, Autumn 2010. European Commission (2010b), European Economy Autumn 2010. European Commission (2008), Convergence Report 2008, Brussels. European Commission (2009), Recommendation for a Council decision granting mutual assistance for Latvia, 52009PC0004(01), Brussels. Feldmann, M. (2008), Baltic States: When Stability Culture Is Not Enough, in: K. Dyson, Euro at 10, Europeization, Power and Convergence, Oxford University Press, Oxford, New York. Gurtner, F. (2004), Why Did Argentina’s Currency Board Collapse?, “The World Economy”, Vol. 27, No. 5.
International Monetary Fund (1998), World Economic Outlook, Washington. International Monetary Fund (2008), World Economic Outlook Database, April. Narodowy Bank Polski, Analiza sytuacji gospodarczej w krajach EŚW, maj 2009, Instytut Ekonomiczny, Biuro Gospodarki Światowej i Europejskiej Integracji Gospodarczej. Reinhard, C.M, Rogoff, K.S, Dieses Mal ist alles anders, FinanzBuch Verlag, München 2010. Sławiński, A. (2007), Znaczenie czynników ryzyka towarzyszących wchodzeniu Polski do ERM2 i do strefy euro, referat na Kongres Ekonomistów Polskich, www.nbp.pl/publikacje/wyklady/plslawinski_euro.pdf. Statistics Estonia, Main Indicators, http://www.stat.ee/main-indicators (as of 10.05.2011). The World bank (2010), EU-10 Regular Economic Report, November. The World Bank (2009), EU10 Regular Economic Report: From Stabilization to Recovery.